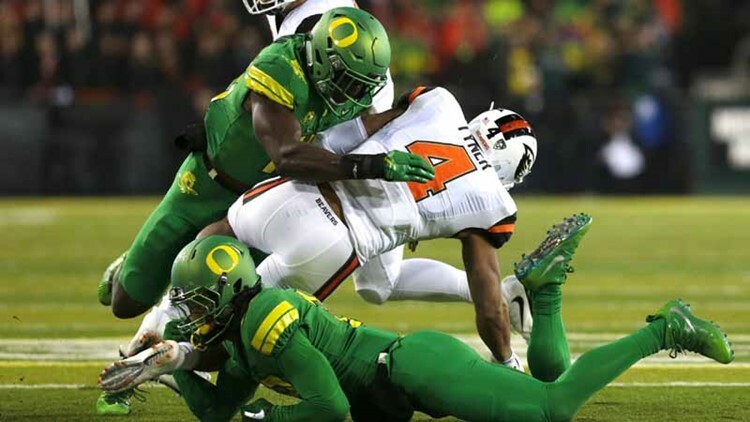 OR television station KEZI reported that Leiato was a passenger in a vehicle that rolled over and crashed about 2:30 a.m. near Autzen Stadium where the Ducks play their home games. Former Oregon linebacker Fotu Leiato, who was dismissed from the team this past spring, was killed in a single-car accident near Autzen Stadium early Friday morning, according to the Eugene (Oregon) Police Department. Leiato's body was found partially covered with brush on a gravel path about 7 a.m. Authorities said Leiato was in his friend's vehicle when it crashed and rolled over into some brush on the side of the road. 22 Year Old Pedro Chavarin Jr. was driving the vehicle before it rolled over according to the Eugene Register Guard. He was taken to a local hospital and later cited for driving under the influence of intoxicants. 'Heart and prayers are with the Leiato family right now as well as the Oregon Football Family after hearing of the loss of Fotu Leiato. He also was charged in January for misdemeanor trespassing. He was expected to play a key role, potentially as a Starter this season under third year Defensive Coordinator Jim Leavitt. Leiato was dismissed from the team in late May after his second arrest in four months. Last season, he had 14 total tackles, including one for a loss, as well as one pass defended.